A host of guests turned up for the event including the Deputy Prime Minister, Hon. Manasseh Maelanga; Speaker of the National Parliament, Hon. Namson Tran; Minister of Foreign Affairs, Hon, Peter Shanel; Minister of the Public Service, Hon. Rick Hou and members of parliament, Hon. Jimmy Lusibaea, Hon. Martin Mokolo and Hon. Joseph Onika. The local business sector was also represented with Our Telekom taking centre stage in a list which included representatives from Lee Kwok Kuen, LBS Engineering, MAT Insurance, Advance Technology and Quan Chee. Several business houses were not present but offered their support in kind. Solbrew donated $5000 worth of beer and soft drinks while Tongs Corporation supplied $2000 worth of meat for the dinner. About half of the funds raised came from the sale of tables whilst the rest was in the form of pledges. While the number of pledges for the evening was not high the amounts sure made up for them. Raffle tickets sold during the dinner raised $5050 and an additional $5000 came after one of the winners Tom Oppenheim, the Deputy British High Commissioner, decided to auction the mobile phone he received in the second raffle draw. Another interesting fundraising feature in the evening was the sing-along show and the top drawer was a rendition of the popular Kwara’ae song Kwatea Mei Nunum by Hon. Maelanaga, Martin Alufurai, William Lai, and Our Telekom CEO, Loyley Ngira. The song raised $1000 cash and additional pledges of $5000 each from Hon. Onika and Hon. Tran. Alufurai’s performance of Swing Low Sweet Chariot raised $1000 cash and $3000 in pledges while Phillip Ohoto’ona raised an additional $1000 for entertaining the guests with a contemporary rock song. Several conditional pledges were also made with the most significant being the announcement from the Minister of Foreign Affairs, Hon. Shanel, that should the men’s football team win a medal at the Pacific Games he will be putting a cabinet paper to support an Asian tour in preparation for the FIFA World Cup qualifiers in 2012. To sweeten the deal Hon. 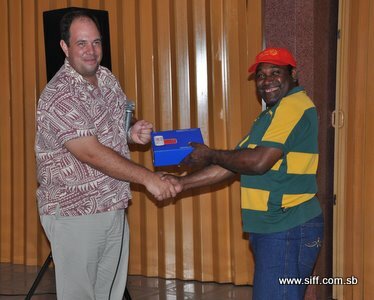 Shanel also offered a $25 000 prize money for the silver medal while his colleague Hon. Tran offered $50 000 to the Bonitos should they win the gold medal. Interestingly four (4) local football clubs also pledged their financial support. Koloale, KOSSA and Western United all pledged $5000 each while Sunbeam made a $2000 commitment to the national team. The biggest announcement of the evening, however, came from Our Telekom who announced a hefty sponsorship package of $350 000 for both the men’s and women’s national teams. Our Telekom Marketing Manager, Robertson Szetu, handed the cheque over to the SIFF President, Martin Alufurai during the dinner event. Bonitos team manager, William Lai, says that he is humbled by the support that the community is showing for the team. Both national teams will leave the country for Noumea, New Caledonia on Wednesday. The Solomon Islands Football Federation (SIFF) and the Solomon Islands national men’s and women’s football teams acknowledge the support of the following organisations and individuals towards the Bonitos fundraising dinner.